Hardwares used in for creating netwoks? One or more network servers is a part of nearly every local area network. Network servers are computers only, but with higher functionalities of serving all computers on network. So they must be very fast computers with a large amount of RAM and storage space, along with a one or more fast network interface card(s). The network operating system provides tools to share server resources and information with network users. A sophisticated permissions-handling system is included, so that access to sensitive information can be carefully tailored to the needs of the users. This requires a computer that can store and quickly share large amounts of information. When configuring such a server, budget is usually the controlling factor. For small networks, a singe network server may provide access control, file sharing, printer sharing, email, database, and other services. Servers should have below features. Computers where humans work are workstations. Laptops and other mobile devices are becoming new generation workstations. These devices typically have modest internal storage, but enough power to serve as a workstation for users on the go. Ethernet cards are usually included with a computer, although additional ethernet cards can be purchased and installed on most computers,. 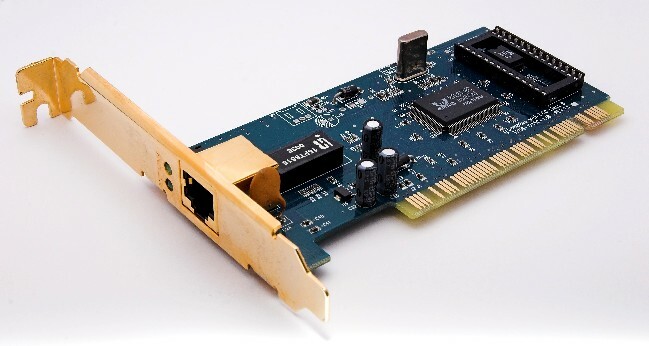 Ethernet cards can contain connections for either coaxial or twisted pair cables . The most common network interface connections are Ethernet cards and wireless adapters. Wireless adapters are found in most portable devices, such as laptops, smart phones, and tablet devices. External wireless adapters can be purchased and installed on most computers having an open USB (Universal Serial Bus) port, or unused expansion slot. An ethernet switch is a device that provides a central connection point for cables from workstations, servers, and peripherals. Most switches are active, that is they electrically amplify the signal as it moves from one device to another. The predecessor of the switch was the hub, which broadcasted all inbound packets out all ports of the device, creating huge amounts of unnecessary network traffic. Modern switches build a port map of all IP address which respond on each port, and only broadcasts on all ports when it doesn’t have a packet’s target IP address already in its port map. Since a signal loses strength as it passes along a cable, it is often necessary to boost the signal with a device called a repeater. The repeater electrically amplifies the signal it receives and rebroadcasts it. Repeaters can be separate devices or they can be incorporated into a concentrator. They are used when the total length of your network cable exceeds the standards set for the type of cable being used. A good example of the use of repeaters would be in a local area network using a star topology with unshielded twisted-pair cabling. The length limit for unshielded twisted-pair cable is 100 meters. The most common configuration is for each workstation to be connected by twisted-pair cable to a multi-port active concentrator. The concentrator amplifies all the signals that pass through it allowing for the total length of cable on the network to exceed the 100 meter limit. A bridge is a device that allows you to segment a large network into two smaller, more efficient networks. If you are adding to an older wiring scheme and want the new network to be up-to-date, a bridge can connect the two. A bridge monitors the information traffic on both sides of the network so that it can pass packets of information to the correct location. Most bridges can “listen” to the network and automatically figure out the address of each computer on both sides of the bridge. The bridge can inspect each message and, if necessary, broadcast it on the other side of the network. The bridge manages the traffic to maintain optimum performance on both sides of the network. You might say that the bridge is like a traffic cop at a busy intersection during rush hour. It keeps information flowing on both sides of the network, but it does not allow unnecessary traffic through. Bridges can be used to connect different types of cabling, or physical topologies. They must, however, be used between networks with the same protocol. Routers are the traffic directors of the global internet. All routers maintain complex routing tables which allow them to determine appropriate paths for packets destined for any address. Routers communicate with each other, and forward network packets out of or into a network. While bridges know the addresses of all computers on each side of the network, routers know the addresses other routers which in turn know about their own networks. Routers can even “listen” to entire networks to determine which sections are busiest — they can then redirect data around those sections until traffic congestion clears. So, routers are network gateways. They move network packets from one network to another, and many can convert from one network protocol to another as necessary. Routers select the best path to route a message, based on the destination address of the packet. The router can direct traffic to prevent head-on collisions, and is smart enough to know when to direct traffic along back roads and shortcuts. If you have a school LAN that you want to connect to the Internet, you will need to purchase a router. In this case, the router serves as the forwarder between the information on your LAN and the Internet. It also determines the best route to send the data over the Internet. A firewall is a networking device or software that is installed at the entrance to a LAN when connecting a networks together, particularly when connecting a private network to a public network, such as the internet. The firewall uses rules to filter traffic into and out of the private network, to protect the private network users and data from malevolent hackers. Firewalls are either hardware or software, depending on their intended use. A firewall used to protect a network is a hardware device that should be installed in the network between the router and the network. Almost all hardware firewalls will have at least two ports, labeled “Trusted” and “Untrusted”. These terms imply the true nature of the firewall’s responsibility to the private network. The public network is connected to the untrusted network port, and the private network is connected to the trusted port. Software firewalls are commonly included in modern workstation and server operating systems. They operate in a similar way as hardware firewalls, except that they filter traffic in and out of the machine itself. These software firewalls are typically unnoticed by machine users, and only need attention occasionslly when an internet-connected application doesn’t work as expected. Gateways can perform all of the functions of switches and routers as well as accomplish protocol conversion at all seven layers of the OSI Reference Model. . Generally consisting of software residing in a host computer equivalent in processing power to a midrange or mainframe, gateway technology is expensive but highly functional. Protocol conversion, rather than encapsulation, can serve to fully convert from Ethernet to Token Ring or any other standard or proprietary protocol. Additionally, protocol conversion can address higher layers of the OSI model, perhaps through Layer 7, the Application Layer. As the process of protocol conversion is complex, gateways tend to operate rather slowly as compared to switches and routers. As a result, they impose additional latency on packet traffic and may create bottlenecks of congestion during periods of peak usage. In a large and complex network routers tend to be positioned at the edges of the network where they can be used to full advantage. Therefore, they make complex and time-consuming decisions and invoke complex and time-consuming processes only where required. Switches tend to be positioned within the core of the network because they can operate with greater speed. Now we can conclude that switch creates separate collision domains and router creates separate broadcast domains. All ports of hub are one collision domain. 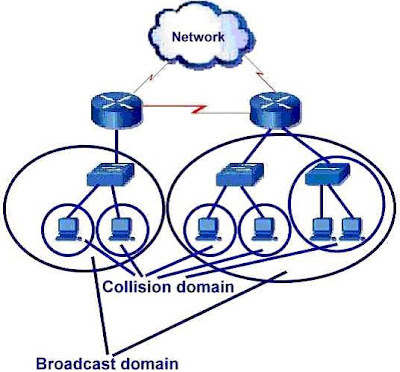 A collision domain is defined as a single CSMA/CD network segment in which there will be a collision if two computers attached to the system both transmit at the same time. A broadcast domain is a logical division of a computer network, in which all nodes can reach each other by broadcast at the data link layer.